September is Whole Grains Month, which probably makes it my favorite month of the year. You know by now that I am very pro-carb and love whole grains! By definition, a whole grain contains all the natural occurring parts and nutrients of the entire grain seed. Refined grains typically have the germ and bran removed, and the accompanying fiber, protein, vitamins and minerals and therefore aren’t as nutritious as the original seed. When one becomes concerned with their carbohydrate intake, it’s easy to want to throw the baby out with the bathwater. It’s true that a high consumption of refined carbohydrates may cause blood sugar disturbances and therefore cravings or lack of good nutrition. However, it would be wise to remember that fiber in whole grains acts like a leaky faucet in that it slows down absorption of glucose into the blood stream resulting in a steady rise which the pancreas can easily keep up with. This prevents spikes and drops in insulin and blood sugar levels that are sometimes attributed to refined products. In fact, your meals will feel more satisfying and keep your body and brain fueled for longer stretches by including adequate fiber from complex carbohydrates such as whole grains. The research is clear on the beneficial impact on including whole grains in your diet. Regular consumption is tied to reduced cholesterol, reduced risk for diabetes, reduced risk for cancer and increased longevity. In fact, you can read more about the Blue Zones and their high carbohydrate consumption while being populations with the longest life expectancy in a recent blog post here. For those of you concerned with gluten, I would also encourage you to consider 5 reasons you may feel you have a problem with gluten from a past blog post here. While grains come under constant attack by low-carb enthusiasts or diet promoters, I encourage you to not put the cart before the horse. As I’ve mentioned before, eating regular balanced meals that consist of protein, fat AND carbohydrate with a fruit and/or vegetable has numerous benefits and that’s in large part due to inclusion of the carbohydrate choice. I would encourage you to make at least ½ of your grains each day whole grains to reap the benefits of the fiber and nutrition found there. 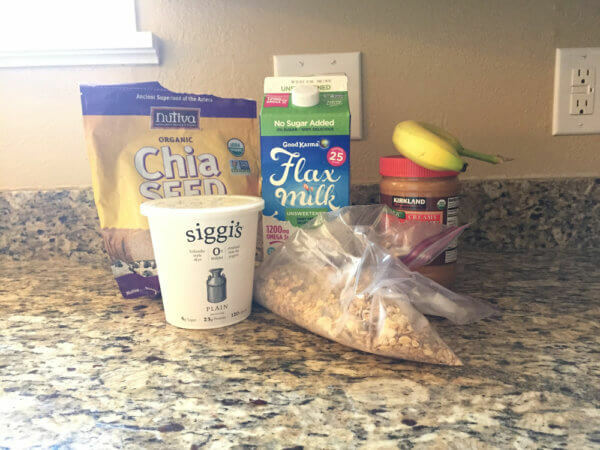 My favorite breakfast of late is Muesli (a mixture of whole grains, dried fruit, nuts and seeds) or a variation of overnight oats that is so popular these days. It’s nice to be able to make this the night before and have it ready for me right when I need it in the morning. It’s also fiber and protein packed with a healthy dose of healthy fats, which keeps me full all morning. Side note: I’m in no way working for or getting paid by Bob’s Red Mill. I just really like this product. It’s a delicious mix of wheat, rye, barley and oat flakes with sunflower seeds, almonds, flaxseed, walnuts, raisins and dates. It has the perfect amount of sweetness and texture, which I feel pairs nicely with the tart flavor of Greek yogurt. Feel free to add 1/2 – 1 tbsp maple syrup if you would like it sweeter. If I just use plain oats in this recipe, I do feel it needs a sweetener of some sort and maple syrup is my favorite. 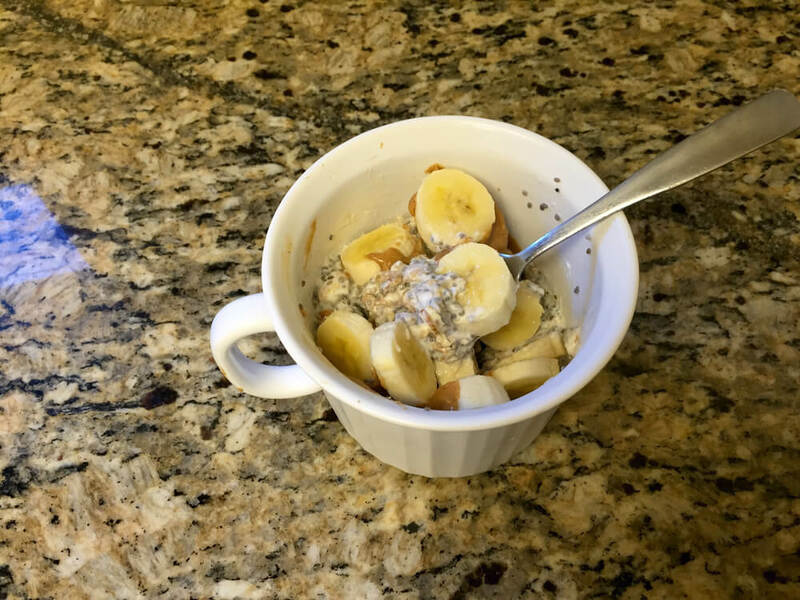 And then I top it with PB and banana…because that’s just what you do. Always. 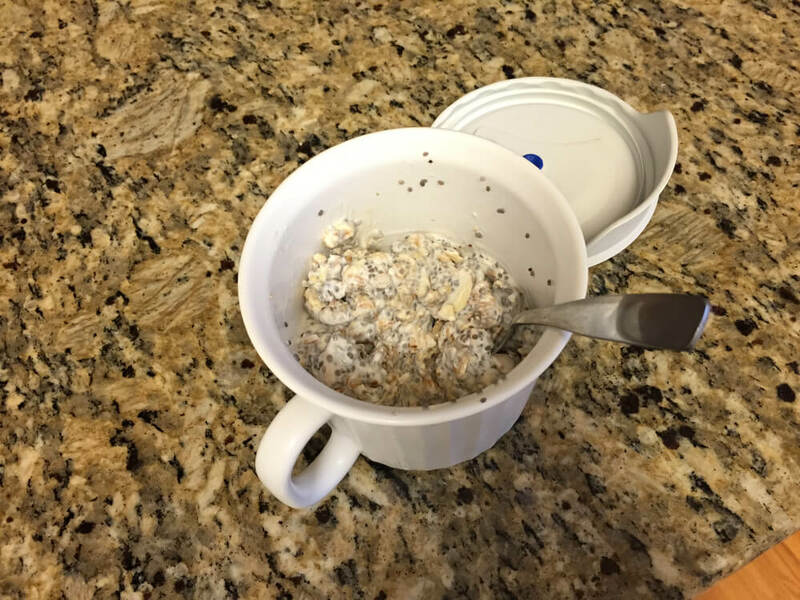 Combine Muesli, yogurt, milk and chia seeds in a bowl or container and mix well. In the morning, top with sliced banana and PB, or fruit and nut butter of choice. Here’s the Muesli all mixed and ready to sleep. 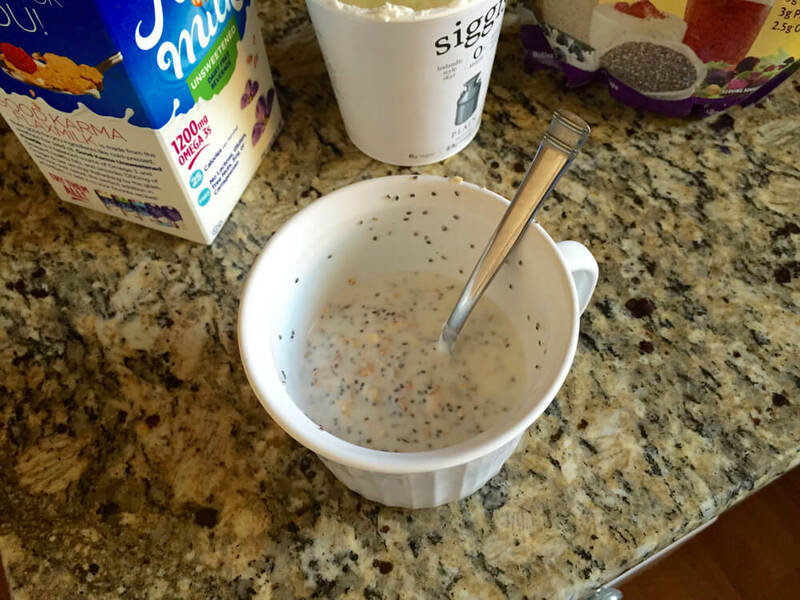 In the morning, it’s all thick and lovely thanks to the whole grains and chia seeds softening and absorbing the liquid. Great explanation of why whole grains – and carbs in general – are an important part of the diet!